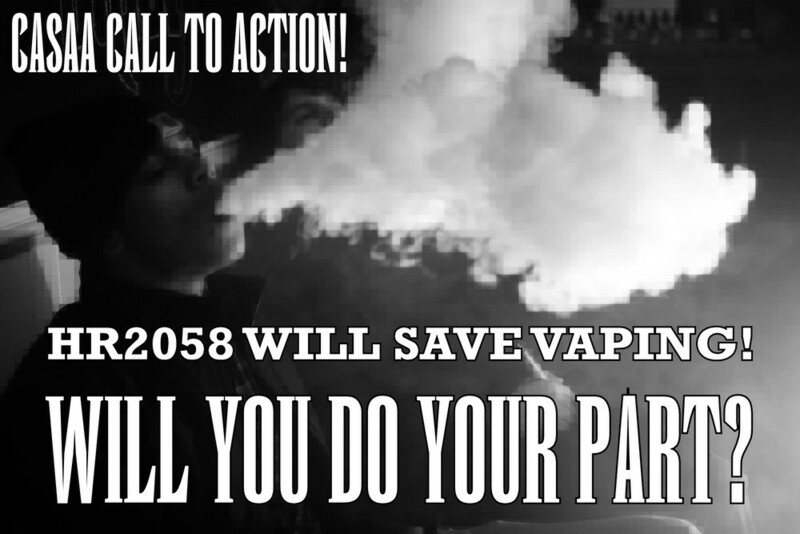 HR2058 WILL SAVE VAPING! WILL YOU DO YOUR PART? In April 2014, the Food and Drug Administration released a proposal to deem all vapor products as tobacco products. Among other things, FDA's proposal would require that companies submit applications for the approval of any product not already on the market as of February 15th, 2007. It also opens a pathway to additional regulations that will make businesses in the vapor industry extremely difficult, if not impossible. Click to email your representatives! Here are the phone numbers you can use. If you call and the line is busy, please take a moment to call your US Representative and urge them to support HR 2058. The talking points are relatively the same, just be sure to mention the bill. You can find your Representative’s contact information here. If you have not already done so, it is critical that you send an email to your Congressional representative and Senators asking them to support and co-sponsor HR 2058, a bill that would stop the FDA from banning 99%-plus of vapor products. I'm a business owner, how will this affect me? 6-12 months: Pre-market tobacco applications (PMTA) will need to be filed for any products introduced after February 15th, 2007 at a cost of $2 million or more - per nic level, per flavor. Note that FDA has yet to approve a single application for a conventional tobacco product. 12-24 months: Competitors will close. Medium/large manufacturers may merge to drum up finances for last-minute applications. 24 months and beyond: 99% of the products you sell today will effectively be banned. Why is HR2058 important? What would it do? This bill was introduced in Congress to adjust the February 15th, 2007 grandfather date to a more reasonable one: the future date on which the FDA finalizes its regulations. If this bill becomes law, all products on the market before the adjusted date would not require a PMTA and would not be subject to a sales ban. This will not stop FDA from regulating vapor products, but will prevent FDA from banning 99% of products currently on the market. FDA is expected to propose additional regulations, but new products that are "substantially equivalent" could be applied for - a far less costly process. Businesses need to take an extra step - contact your federal representatives and request a meeting with the House Rep or their staff to discuss this bill. When you meet, tell them why this bill is so important to you, your business, your family, and your customers. Refer a Smoker and get Rewarded - Sponsor Program a Success!